The Natural Science Center of Greensboro, North Carolina is currently in the process of adding "Animal Discovery," a future outdoor zoological garden. To help celebrate this new addition, they decided to create new animal additions in their main lobby. The main lobby is a huge space, containing a full size tyrannosaurus rex, the largest Quartz Geode I have ever seen, and an amazing animal mural. Since one of the large windows was left empty, it became the perfect space for a monumental rolling ball sculpture. 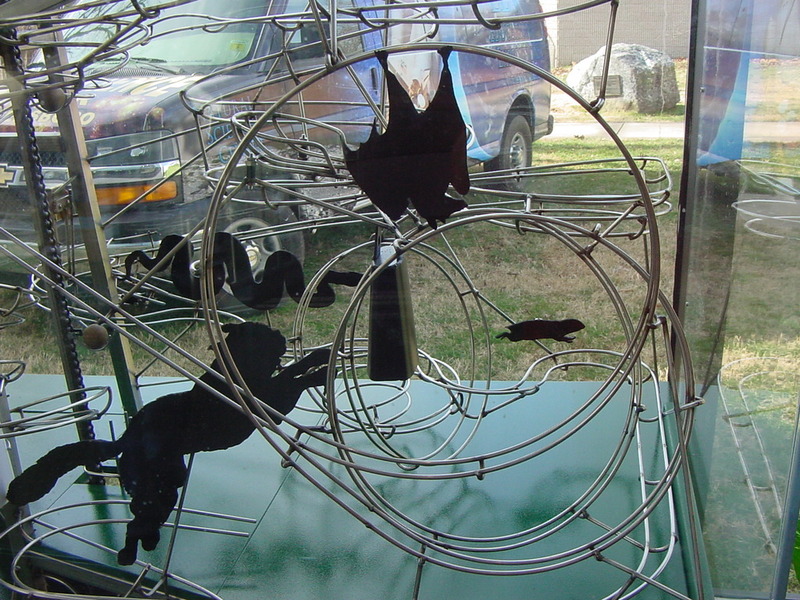 But how could a rolling ball sculpture relate to animals? 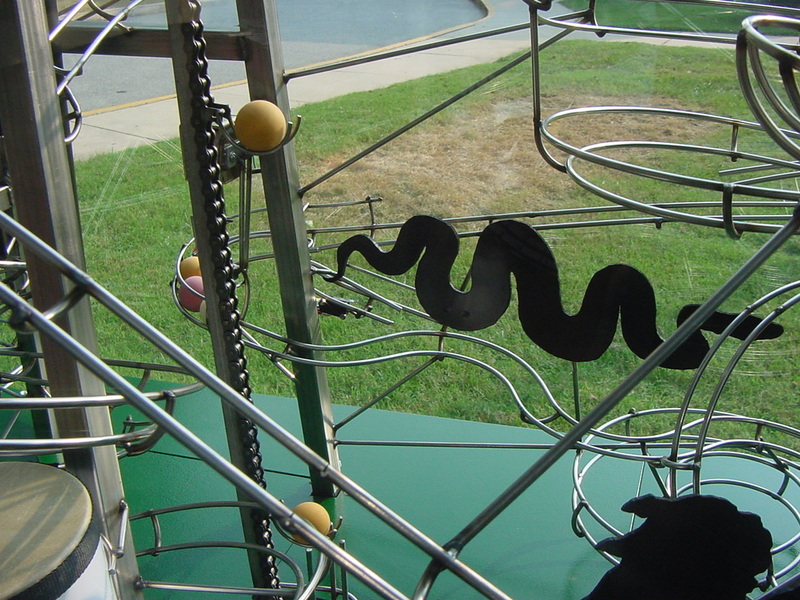 It is true that rolling ball sculptures lend themselves very well to demonstrating anything that contains mathematics, engineering, and physics. It is also true that the movements of animals are bound by the same principles that govern mathematics, engineering, and physics. So, with a little bit creativity, the kinetic motion of the rolling balls in a sculpture can exhibit the kinetic motion of animals. The basis of Creature Kinetics. The idea was to use the motion and handling of the balls to represent similar motions created by animals. Near the particular motion, I would provide an example of the type of animal exhibiting the same movement. In this case, I used animal cut-outs, painted black, to suggest the animal. An example of this would be the bongo hops. Here, the ball is dropped off the track where it bounces off two bongos and into a catch. Right above the bongos is a black silhouette of a frog mid-leap. It is easy to create the connection here. What is really suprising is how quickly children discover the connections on their own. The Creature Kinetics Rolling Ball Sculpture stands over 16 feet tall. This Creature Kinetics track element simulates a snake chasing a mouse. 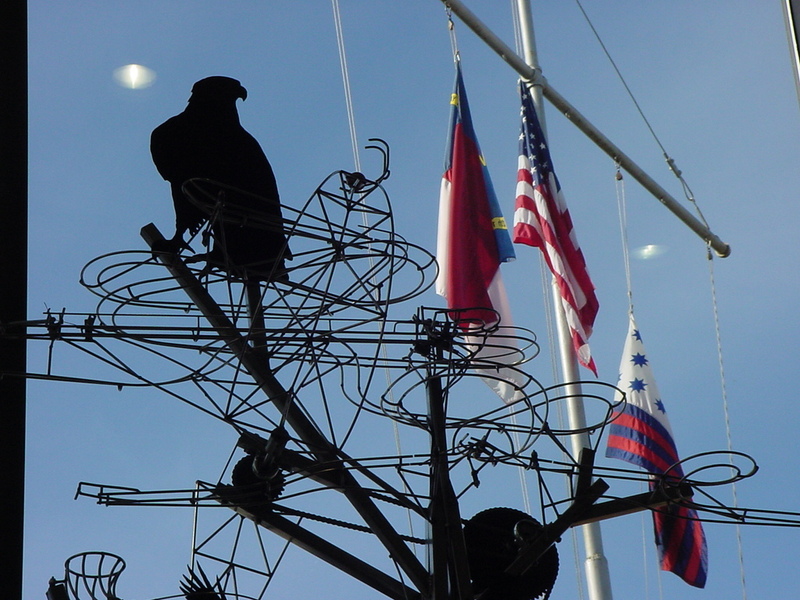 The top of Creature Kinetics features a perched eagle. A rotating arm has a "talon" that picks up a single ball and deposits it at the highest point. One of the truly unique features of this sculpture is something called the "pinnacle event." The pinnacle event happens about every 20 minutes in this manner. 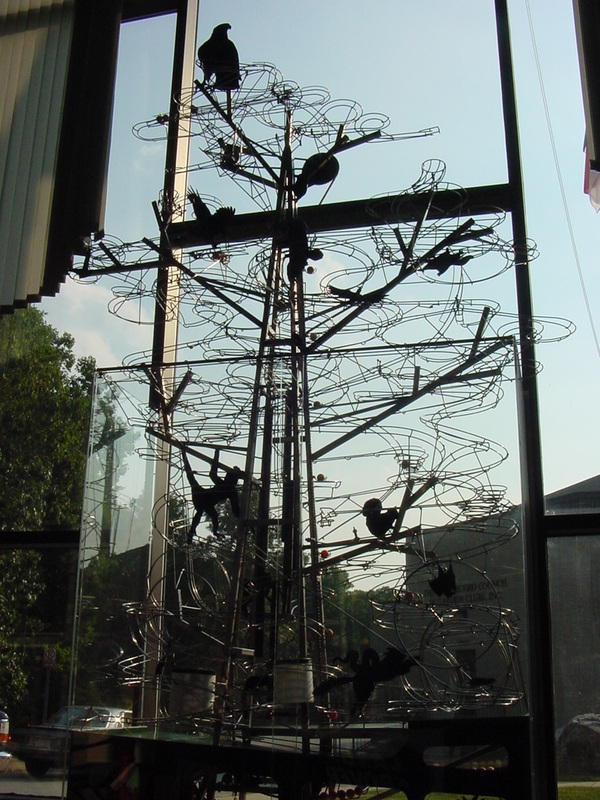 As the sculpture operates normally, a large arm swings in a wide circle, picking up a ball with a metal claw at the bottom of every revolution. The arm rotates at one revolution per minute. When the arm reaches the top of the large circle, the ball falls off the claw, drops into a basket, and rolls to a ball queue. 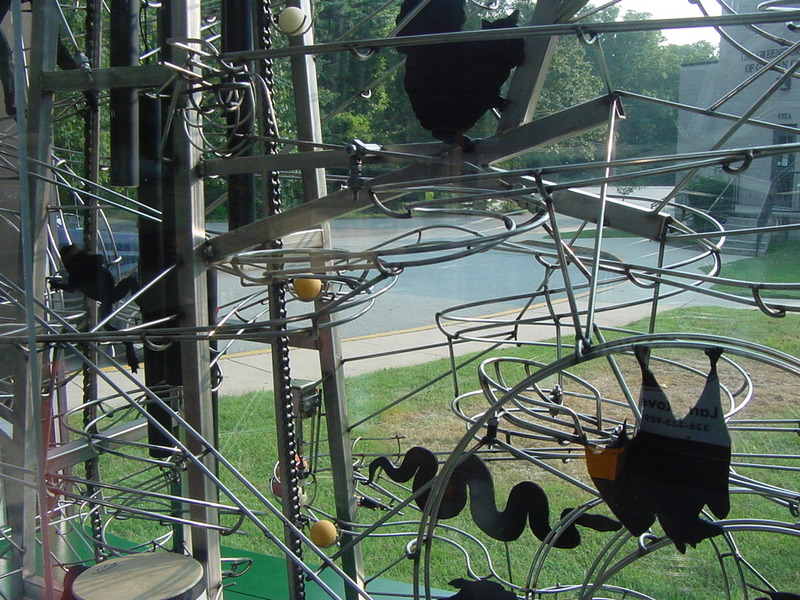 When twenty balls have been collected up top, the whole sculpture shuts off. The sculpture pauses as the remaining balls travel down the tracks to the bottom. Once the motion has stopped, a ball is kicked off the end of the queue line, free-falling about 4 feet into a basket. After the ball drops down and rings some bells, the line of 19 remaining balls is released in rapid succession. The balls drop off the end of the trees top branches, and into the main sculpture. The large about of balls rapidly descending the tracks creates quite a flurry of activity. As one child watched it, he exclaimed, "It looks like a bunch of bugs." A short time after the last ball stops rolling, the sculpture starts back up and begins the cycle over again. Can you wait another 20 minutes? Track elements of the Creature Kinetics Rolling Ball Sculpture. The large loop-the-loop of Creature Kinetics reminds some kids of bat's suspended from the ceiling.